In 1925, at 3 years old, Bauersfeld’s father showed him a crystal radio. “They turned it on and I heard this sound. And it was explosive,” Bauersfeld said decades later. “It was a simple sound, but to me it was something coming from nothing. I sat in amazement at it.” It was so profound it became his career path: Bauersfeld spent more than 50 years in radio, mostly doing voices in radio dramas; he was head of the drama department at KPFA in the San Francisco Bay Area from 1963 to 1991. 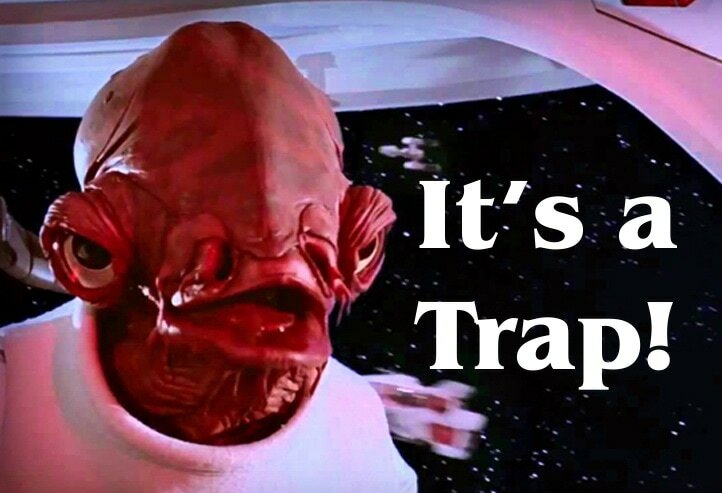 “It’s a trap!” The meme. But he’s best known for a single line in a movie. He happened to be at Lucasfilm as they were doing production work on a film. He was asked to do about 12 lines of a character, and they showed him a photo of the alien. “I saw the face,” Bauersfeld said later, “and I knew what he must sound like.” The lines took less than an hour to record, but one in particular — “It’s a trap!” by rebel commander Admiral Ackbar the 1983 Star Wars movie “Return of the Jedi” — became a legend, and a cliché “meme” online (photo). “I don’t remember the first request for an autograph,” Bauersfeld said in 2011. “But I was quite pleased. I thought, ‘My God, somebody is actually writing to me about something that I almost don’t remember doing.’ Then they began to come in by the dozens and dozens and dozens.” Bauersfeld reprised the role in some Star Wars video games, and in the 2015 prequel/sequel, “The Force Awakens.” He also voiced Bib Fortuna, Jabba the Hut’s slimy minion. Bauersfeld died April 3 at his home in Berkeley, Calif. He was 93.